All right – heat your oven to 345 degrees. On a big cutting board liberally sprinkle about a tablespoon of garlic powder, 1/4 teaspoon of curry and 1/2 tablespoon of everything else and mix it all up to make a rub — then roll your tenderloin in the savory goodness! In a large skillet – put about 3 tablespoons of good olive oil and get the skillet very hot. Once it’s sizzling, you’re going to sear your tenderloin on all sides. Use tongs to move it around- not a fork – you don’t want to pierce the meat. You’ll even want to hold it upright and make sure you sear the ends of it! Once it’s nice an golden on all sides put on a cooking sheet or shallow roasting pan and put in the oven to roast for 40 minutes. NO LONGER! 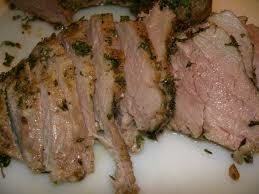 Take out and let your roast rest at 10 minutes before slicing into medallions. Into your searing skillet, add 2 tablespoons butter, 1/4 cup of white wine and splash of lemon juice to the drippings and simmer until you get all that good stuff off the bottom of the pan and then set aside. Great to garnish your tenderloin! We like to serve over a bed of pasta or with jasmine rice! Great for family dinner or dinner party! One of the easiest and tastiest meals you can make! (I keep saying that!) I can never make just ONE rack of ribs- they go to fast in my house! All right – on a cookie sheet lay sheets of heavy duty aluminum foil (you’re going to create 2 big pockets) – place one rack of ribs in each pocket – season each rack with salt/pepper/garlic powder. Place meat side down. Onto the top of each sprinkle ¼ cup brown sugar and 2 tablespoons apple cider vinegar. Close each packet tightly. Place in 270 degree oven for 2 ½ hours. No peeking – no touching – no nothing! They will literally be fall-off-the-bone amazing! Where’s that Staples Easy Button when you need it? 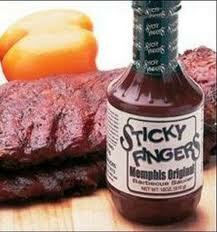 If you like top with favorite bbq sauce the last 15-20 minutes or just warm the sauce on the side for those who like it – they are fall off the bone – best things – whether you bbq them up or not! 😉 We like to serve them with skillet home fries and cole slaw – What would YOU like to serve them with! HINT: If you have a Super Target near you…keep an eye on their rib section – at the one near me – every now and then they run a special (usually right BEFORE a big holiday or game) and you can get them for $5-$6 a rack — when you do — STOCK UP! They freeze really well! Very simply the easiest recipe on the planet! Place pork in crock pot, pour bottle of marinade over it. Put your crock pot on low – and let it cook all day! By the time you get home from work your house will smell like a Cuban restaurant and your family will sing your praises! Shred the pork with two forks. I serve with black beans, rice and a loaf of Cuban bread. 1-2 large cans of black beans (depending on your family’s size), add 1/4 cup of the mojo drippings from your crockpot, 1 small onion diced, 1 small green pepper diced, let simmer for 15-20 minutes while your rice cooks and you’ve got a great meal! 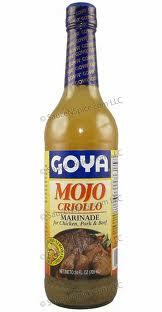 Look for the marinade in the ethnic section of your grocery store or ask your grocer for it!